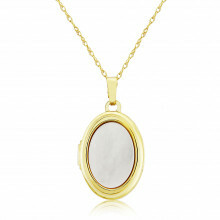 Long, oval shaped Locket with a sleek polished finish and a fine trace chain which can be worn at 16" or 18". There is Yin Yan pattern on the front and an indented border on the back. The Locket is hinged and opens to reveal a space to keep your personal memories, photograph or miniature keepsake. A truly special and meaningful gift and one of our bestselling Lockets.